Now that the winter months are here, runny noses and sore throats are inevitable. You may have your go-to medicine or at-home remedies to cure these annoyances, but did you know they could actually be affecting your oral health? Keep reading to learn how some of the most common cold and flu remedies impact your teeth and gums from a trusted dentist. Cough drops sure do provide you relief when you need it, but they can actually damage your teeth. These products are made to dissolve slowly, with most of them containing sugar. This allows sugar to coat your teeth and mouth, which causes decay and cavities. Your best option is to choose sugar-free products, but if you do use cough drops with sugar, be sure to brush your teeth after. Sugar will eventually eat away at your tooth enamel if it isn’t cleaned right away. Decongestants are great for combatting your runny nose by drying it out, but did you know it dries out your mouth too? It actually reduces your flow of saliva, which helps bacteria grow in your mouth. This can contribute to tooth decay and gum disease. Usually decongestant use is temporary, but there are ways to keep your mouth hydrated. You can drink water to keep your mouth lubricated, and you can chew sugar-free gum to stimulate saliva flow. Just like cough drops, a lot of liquid medicines contain sugar. These sticky and thick liquids coat your teeth automatically, causing the sugar to coat your teeth as well. Some of these products may also contain alcohol, which also dries out your mouth. If possible, choose medicines that come in pill or gel-capsule form to avoid sugary liquids. If you have syrup medicine that you live by, just be sure to brush your teeth after to remove any residue left behind. Many people turn to orange juice or other citric beverages when they’re feeling under the weather. The acidity in these beverages can actually soften and damage your tooth enamel. That being said, orange juice is packed with vitamin C, which can boost your immune system to help battle illness. The solution? Try to consume all of your OJ in one sitting, so you can brush your teeth after to remove the sugar and acid from your pearly whites. Drink water throughout your day, and then drink orange juice around meal time. You can also find juice rich in calcium that strengthens your enamel. When it comes to cold and flu season, don’t let the cure cause another problem altogether. Use these tips to stay healthy for the winter and keep your smile in good shape. Dr. Jayme Martinez enjoys getting to know his patients to provide the most personalized care possible. 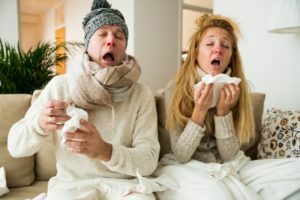 He believes in patient education, which is why he wants you to be aware of some of the risks you may face with cold and flu remedies this winter. He currently practices at Kessler Park dental, and he can be contacted through his website or by phone at (214) 303-9969 for any questions.